LEARN A SKILL WITH PHIL! Since turning seventy I have been giving more thought to passing on the skills which I have acquired during a lifetime devoted to creativity, before it is too late. I have decided to run courses for small groups or individuals in my workshops where learning can be drawn from talks, shadowing me in the workshop, hands on workshop practise or even making your own end product under my supervision. 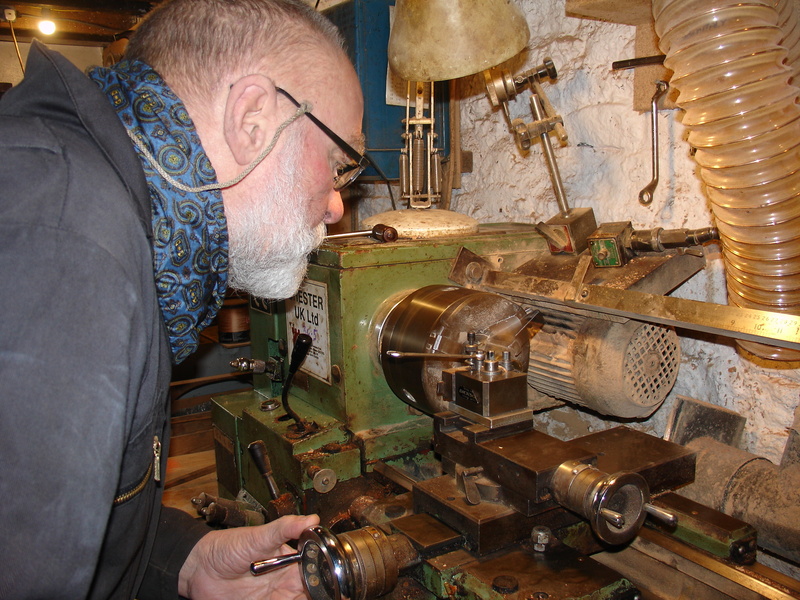 Classroom courses will be available in the form of illustrated talks on the detail of techniques employed by the instrument maker to cover voicing and tuning of flutes, recorders and whistles. Also including selection of materials, seasoning and preparation and manufacturing techniques. My work is done using metal turning lathes and other engineering tools which might be found in the home workshop and any tuition will reflect this. I do not teach or recommend the use of wood turning lathes. Classroom courses will also cover the use of hand tools, machine tools and making your own tools, including special purpose machines and tapered reamers. Classroom courses will be one or two days and might have as many as 5 attendees. Workshop shadowing courses will involve you watching every stage in the making of a keyless flute, a descant recorder or a whistle. I will explain every step in detail, answering questions as the course progresses. These courses might have one or two participants and will last 5 days. Hands on courses in the workshop will involve you in the making of a working instrument to take home at the end of the course. Your course could be based on the making of a keyless flute, a descant recorder or a whistle. 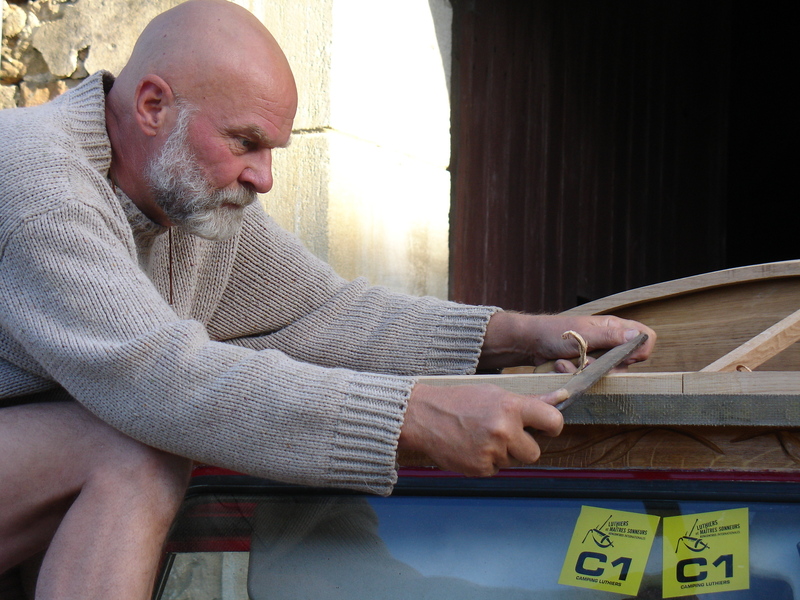 You will, if you wish, carry out all of the operations to make a finished instrument from a rough sawn blank. Hands on courses will be one on one and last 5 days. Classroom based courses covering all aspects of the engineering machine shop - getting the best from your lathe, the milling machine, drilling, tool sharpening and grinding - metal joining techniques including soft soldering, hard soldering, brazing and welding - hand tools and how to use them - cutting tools - measuring instruments and how to use them. Classroom courses will be one or two days and might have as many as 5 attendees. Hands on workshop practise courses teaching the skills of the fitter. ie :- sawing, filing, scraping (including bearings), drilling, reaming and thread cutting. You will learn to sharpen drills and other tools, heat treatment techniques and the safe use of the off hand grinder. You will learn the use of measuring tools in hand fitting.Hands on courses will be one on one and last 5 days. You may wish to concentrate your course around the making of an item to take home with you, for example, a centre punch, a scriber or a pair of calipers. Hands on machine shop practise courses will cover every aspect of the use of the surfacing, sliding and screw-cutting lathe (engineer's centre lathe) including tool grinding/sharpening and the use of disposable tip tools. The safe use of the off hand grinder will be included. The use of the milling and drilling machines will also be studied.The course will also cover work-holding and simple jig and fixture production. Hands on courses will be one on one and last 5 days. Your course could be centred around making an item to take away with you such as a tap wrench or a scribing block. 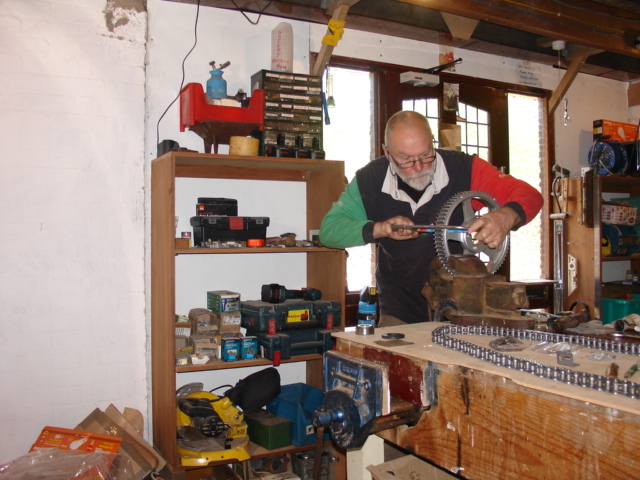 Bring your Morgan three wheeler to my workshop and, under my supervision, fit the P G. Bleazey drive train upgrade kit. Working in my garage and using my tools, you will receive support at every stage of the process - removing the bevel box and engine, inspecting the components, machining parts to be modified (carried out by me), rebuilding everything and finishing the course with a test drive to be sure all is well. Along the way you will pick up tips on care and maintenance of the machine in daily use and any little points that need attention will be addressed to the best of my ability. One on one is best but you may bring along one friend to observe and assist if you wish. The complete installation and all modifications will be anticipated to take two full days but unforeseen difficulties might prolong the process so come prepared. At every stage on any of the courses, attention will be paid to safe working practise and this will be a requirement throughout the courses. Each course will start with a discussion on safe working practises. The workshop based courses will involve the use of sharp, powered, dangerous tools. Safe practises will be followed at all times, or I reserve the right to terminate the course and your fee will be forfeit. If you are attending a hands on course, please come equipped with strong sensible shoes and suitable protective clothing such as an apron or boiler suit. I started work at the age of sixteen, serving five years as an apprentice fitter and turner in a Shell oil refinery. During that time I attended college and gained the City and Guilds of London Institute, full technological certificate in mechanical engineering production. I later became registered with the Engineering Council as an incorporated mechanical engineer. My subsequent career saw me working in a steel foundry, a ship yard, munitions production, a starch refinery and numerous other industries. In 1980 I started my own engineering business designing, building and troubleshooting heavy machinery, mainly in the food industry. In 1990 an interest in historical artefacts led me to start an offshoot business " Musket, Fife and Drum " my wife Cathie and I made all three!" Evolution of the businesses led to me becoming a full time maker of instruments in the flute family - flutes, recorders and whistles and I still make these today. I have owned, maintained and rebuilt Velocette motorcycles since the age of sixteen and have recently become the owner of a 2013 Morgan three wheeler. 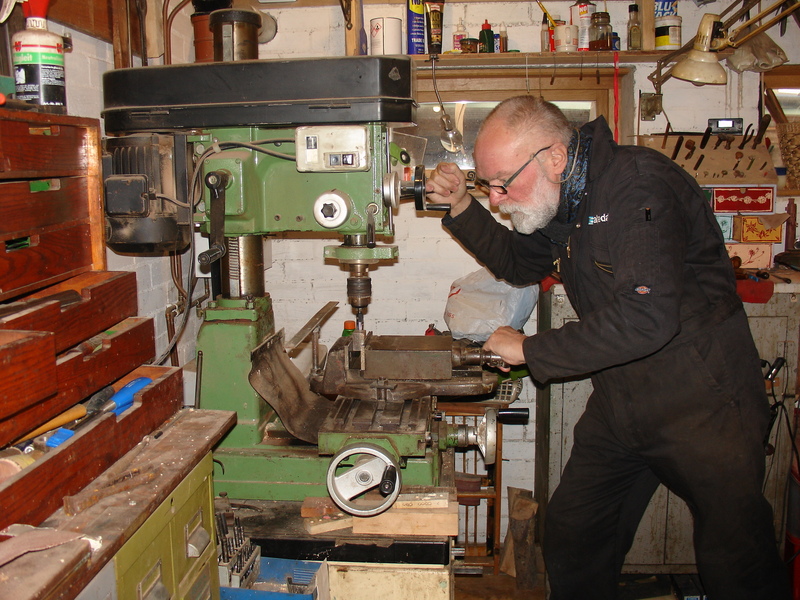 My workshop is equipped with small machines such as may be found in any home workshop and you will be studying in an environment dedicated to light engineering and the manufacture of both woodwind instruments and components for the Morgan Three Wheeler. Course prices will start from £80:00 per day for classroom based courses with multiple attendees through to £200:00 per day for one on one courses in the workshop. I like to discuss the content and duration of courses with students before making a booking, courses and prices can thus be tailored to individual learning needs. Participants will be provided with tea/coffee and a lunch every day. We may be able to arrange self catering, local accommodation at Claires Little Crooked House (or we can supply a list of local hostelries) - and evening meals can be found at many good restaurants, close by. If you have an interest in any of my courses and would like to discuss prices or tailoring of a course to suit your own needs then please click the mail button below or give me a ring - I look forward to hearing from you.